Drought tolerant small evergreen shrub that is useful as a ground cover or as a low hedge. Small cream flowers during summer. A mound forming plant Helichrysum petiolare or ‘Liquorice Plant’ does well in sunny positions. Grows well in coastal areas and be clipped back to maintain shape. Often difficult to find in nurseries H. petiolare (foliage pictured right) is another ‘old fashioned plant’ well suited to use in a cottage garden. Used largely as tall growing ground cover it will quickly cover over 1 square metre but is fairly easy to control. It is drought tolerant once established, so is a great plant for hot sunny positions. It grows well in containers and is also suited to hanging baskets. 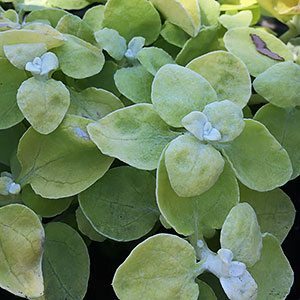 Grown mainly for its soft grey green aromatic foliage (smells a bit like liquorice) it is drought tolerant and generally hardy. Tall flowers spikes appear in early summer with cream coloured flowers lasting well into summer and autumn. Propagation is easy from cuttings taken during the growing season. Can be cut back hard to maintain shape. If you are looking for a plant to use in the border as a filler, or on embankments as a ground cover plant Helichrysum petiolare or ‘liquorice plant is worth looking at.